All referees shall be USSF certified, and should be older than the age group playing the game. Referees are assigned by the local referee assignor. The referee is responsible for control of the game. The referee's decisions are final and his/her judgments are not protestable. For all 11 v 11 games the local referee assignor will assign one referee and two assistant referees. For all spring season playoff and tournament final games, the playoff committee will assign three-official crews. In all small sided regular-season games, both spring and fall, the local referee assignor will assign one referee, and each team may be asked to provide a CORI cleared volunteer club linesman (see Law 6). Some towns at their option and cost may assign more officials than required by i or ii above to support ongoing referee training programs or for other reasons. It is allowable for the local referee assignor to add properly qualified officials to a match. 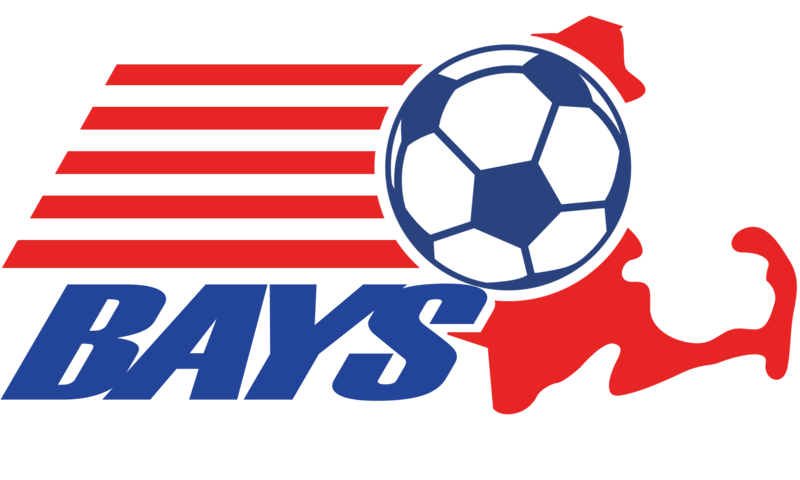 The BAYS on-line referee reporting system shall be used for all games. All assigned officials shall report the score; any cautions or ejections; and any other pertinent information. The referee should also fill out a USSF referee report when any serious unusual incident occurs, including when any player is seriously injured. In games requiring passcards, the referee must keep the passcard(s) for the person(s) ejected, and must send the passcards to the BAYS ejection secretary. No Show or Incapacitation of a match official. In the event the referee does not arrive within fifteen (15) minutes after the scheduled kickoff, both coaches should make every effort to agree on an acting referee so that the match is played and counted as an official game. If a scheduled referee does not arrive by 15 minutes past the stated game start time, he/she is not entitled to any fee, unless the acting referee, already selected and agreed upon by both coaches, relinquishes his/her whistle. The referee assignor must be notified by the home coach if a referee is either a no-show or tardy, so that corrective action can be taken. If the referee or acting referee of a match with only one game official becomes injured and is forced to withdraw from the match, both teams’ coaches should make every effort to agree on a replacement referee, who meets the requirements of this section, so that the match is played and counted as an official game. An acting referee may be a USSF certified referee with an active CORI with a current badge or a adult with a valid BAYS coaches card. In the younger Grade Groups, it is also possible to have a youth (under the age of 18) referee the game if that youth has referee experience. A CORI check is not required for minors. Spectators and parent volunteers who are not registered with BAYS may not serve as an acting referee. In the event that both coaches cannot agree on an acting referee the game shall be postponed as if the field were unplayable. The BAYS Division Director will be notified by the coaches that the game was not able to be played due to a no-show referee and no suitable replacement being available. • No Game (the game will not be made up nor scored nor forfeited). Decision by the Division Director may be reviewed by the VP that is the executive director of the section in question upon request of one of the involved clubs. The VP decision/confirmation is final.. If a scheduled referee does not arrive by 15 minutes past the stated game start time, he/she is not entitled to any fee, unless the acting referee, already selected and agreed upon by both coaches, relinquishes his/her whistle. The referee assignor must be notified by the home coach if a referee is either a no-show or tardy, so that corrective attention can be taken. Note: Some towns have ongoing referee training programs and at times, non-tournament small sided games could be officiated using a referee and two assistant referees.